The Dallas Cowboys did something completely unexpected during the 2018 NFL Draft, they traded for veteran running back/wide receiver/return specialist, Tavon Austin. These kind of draft day trades are uncommon in the NFL and rarely pay off, but this is someone who could add an entirely different element to the Cowboys offense. 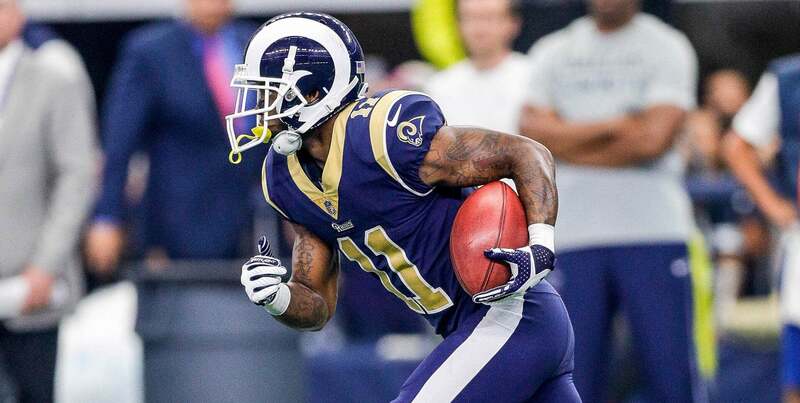 Now that Tavon Austin is now a member of the Dallas Cowboys, I wanted to get a little bit more familiar with the type of player he is and how he fits into the offensive scheme. I'll be completely honest, I wasn't all too familiar with Tavon Austin. The only things I really knew about him was that he is dangerous in space and that he has been mostly used as a "gadget" player for the majority of his professional career with the St. Louis/Los Angeles Rams. When I started watching his game film with the Rams, everything I believed he was proved true. But, his professional game tape left me wondering how he would fit in with the Cowboys, so I decided to dig a little deeper to find out how he was utilized in college. I did this because I thought he could've been better utilized in the NFL. Austin's college game film as you can imagine was much better than his professional film. You could argue that was because of the different levels in competition, but I think it was because West Virginia had a much better understanding of his strengths and weaknesses. The main difference I noticed in his professional game tape and his college tape was that he was used much more as a running back at West Virginia than he was with the Rams. I think this is where he is most comfortable, even though he is undersized for the position at just 5'9", 175 pounds. Strangely enough, I think the Dallas Cowboys agree because that's the way he was announced when the trade was completed. I would expect the Cowboys use Tavon Austin as a change of pace/receiving back to complement Ezekiel Elliott, and I couldn't be more excited about his addition. Austin is an explosive player and he has the ability to take over a game almost all by himself because of his unique skill set. I discovered this when I watched what he was able to accomplish in 2012 against a 10th-ranked Oklahoma Sooner team. He accumulated 572 All-Purpose Yards, 344 of which were rushing yards, and 2 touchdowns. I wanted to share with you a few of his explosive plays in that matchup and how I think he could be utilized in the Dallas Cowboys offense this season. This was just one of several long runs Tavon Austin had against Oklahoma. The Sooner defense didn't have an answer for him all game. Austin starts the play lined up in the backfield as the running back in the pistol formation behind Geno Smith. Dallas doesn't run a lot of pistol formations, but this is exactly the kind of outside zone play he will run with the Cowboys and the results we could see because of his speed/explosion. Now, I understand this play was perfectly blocked, but all Austin needs is a crease and he's gone. We've all heard that "speed kills" in the NFL. Well, Tavon Austin has that in spades. He can be really dangerous behind the Cowboys talented offensive line, even if he only receives a handful of carries a game. Here's another example of how dangerous he can be because of his speed, even in a goal line situation. Tavon Austin probably won't be asked to run the ball very much around the goal line for the Dallas Cowboys because of how proficient Ezekiel Elliott is in short yardage situations, but the play above proves he can still be dangerous in short yardage situations. On this play, things aren't as perfectly blocked as they were in the earlier clip. Austin had to use both his speed and elusiveness to shake a defender, who nearly had the play stopped in the backfield, in order to find the end zone. It's an impressive run that could come in handy for the Cowboys in 2018. The fact that Tavon Austin is more well-known as a wide receiver in the NFL should tell you all you need to know about how dangerous he can be in the receiving game. I think he will be utilized as a receiver with the Dallas Cowboys, but I think it will mostly be as a RB coming out of the backfield. Because of his size, Austin would have to play out of the slot with the Cowboys. Cole Beasley currently holds down this position and is not only a better receiver, but has Dak Prescott's confidence. Austin may spell Beasley from time to time, but I don't believe it will be his primary position. This simple pitch and catch play is exactly how I believe Scott Linehan will use Tavon Austin in the Cowboys passing game. Austin is easily able to pick up 10 yards and the first down here because of how quickly he gets up the field after the catch. He will be a mismatch against bigger/slower linebackers and gives Prescott a safety valve in the passing game if he needs to get rid of the ball quickly. This is something that should prove invaluable in 2018, especially after how frustrating things were with the passing game last season. Overall, there are a variety different ways Offensive Coordinator Scott Linehan can get Tavon Austin involved in the Cowboys offense in both the running and passing game. I personally believe we will see him lined up as a RB the majority of the time, but will be used as a WR as well. We will see Austin take handoffs out of the backfield, run jet sweeps, reverses, RB/WR screens, swing/dump off passes, run routes in the passing game, and of course be heavily involved in the return game as both a kick and punt returner. All in all, he could be the explosive element the Cowboys offense has been missing for some time now. What role do you envision Tavon Austin having with the Dallas Cowboys?